Bright red with a fine white edge on the petals. Late spring flowering, 50-70 cm tall. Choose a planting spot where the soil drains well. Plant 5-7 cm deep and 4-6 cm apart. 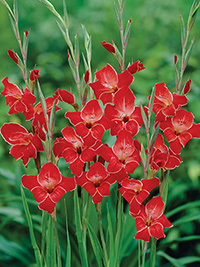 Gladioli nanus multiply quickly and make an excellent cut flower.